If your trainees are really enthusiastic about cycling, why not signpost them to other activities to encourage them to keep on cycling after the Bikeability Scotland training ends? Pedal for Scotland - mass participation cycle rides every September, with the main event being a 47-mile leisurely ride from Glasgow to Edinburgh, but with shorter family rides also available around Scotland. Sky Ride - free weekend guided bike rides for all ages and abilities. Local cycle hubs - there are an increasing number of cycle hubs across Scotland which organise many events and rides throughout the year. Make sure your trainees know about their nearby hub, and tell them about any upcoming rides. I Bike - various activities designed to encourage children to carry on cycling when moving from primary to secondary schools, and encouraging more girls to cycle to schools. I Bike currently operates in five local authorities - please click the link to find out if they're in your area. Bike to School Week - an annual event when pupils are encouraged to cycle to school for the week. The Big Pedal - an annual inter-school cycling challenge, where schools compete to see who can get the most pupils, staff and families cycling to school. 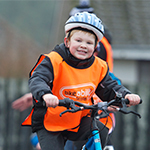 Go Ride - Scottish Cycling's development programme for young people. Go Mountain Bike - some of your more adventurous trainees might like to learn about mountain biking by attending this course. Bike Week - an annual event with various activities across the country to promote cycling. Bike Events Scotland has a comprehensive listing for all types of cycling events in Scotland, including beginner rides, family rides, fundraising rides, mountain biking events, sportives, road cycling and much more.